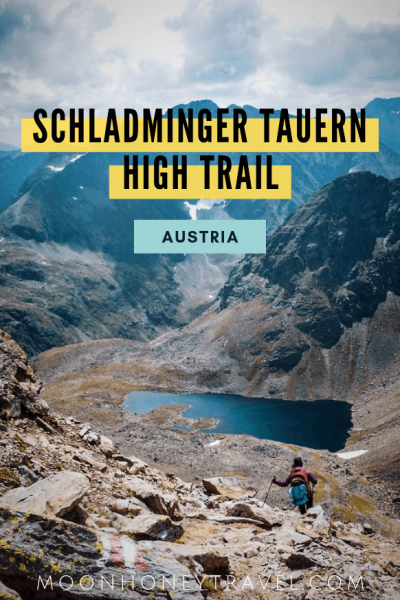 The Schladminger Tauern High Trail (Höhenweg in German) is an epic multi-day hike in the Austrian Alps. 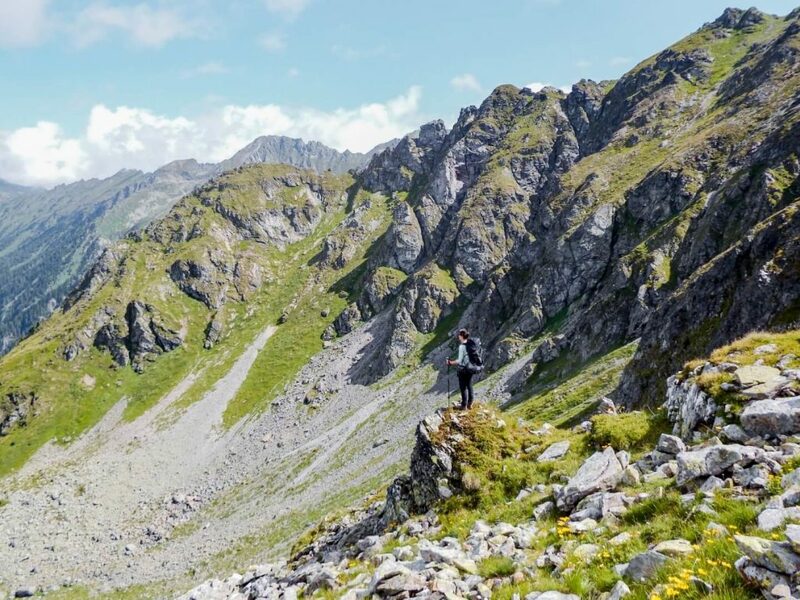 The trail runs along the summits and ridgelines of the Schladminger Tauern mountains and drops into idyllic valleys and alpine cirques. 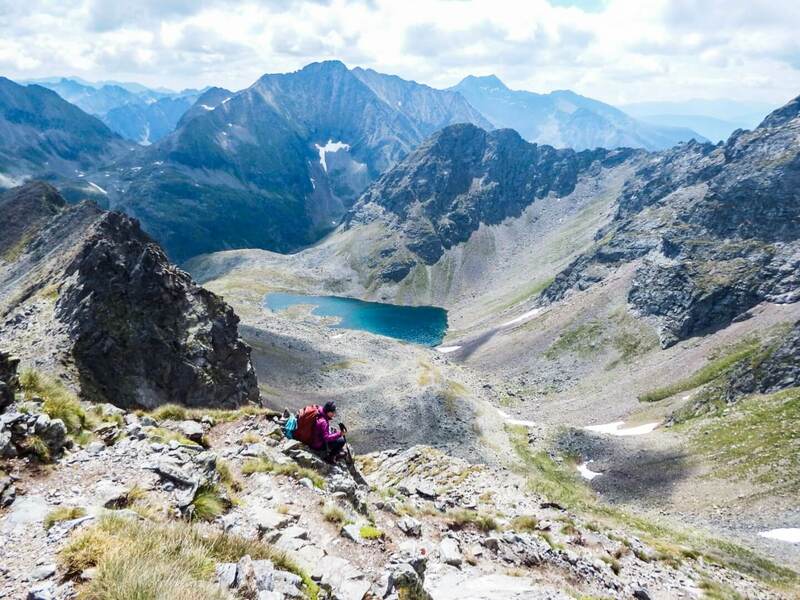 It’s a challenging hike that rewards you with panoramic views of alpine lakes, near and far mountains, picturesque meadows-capes, and cascading waterfalls. 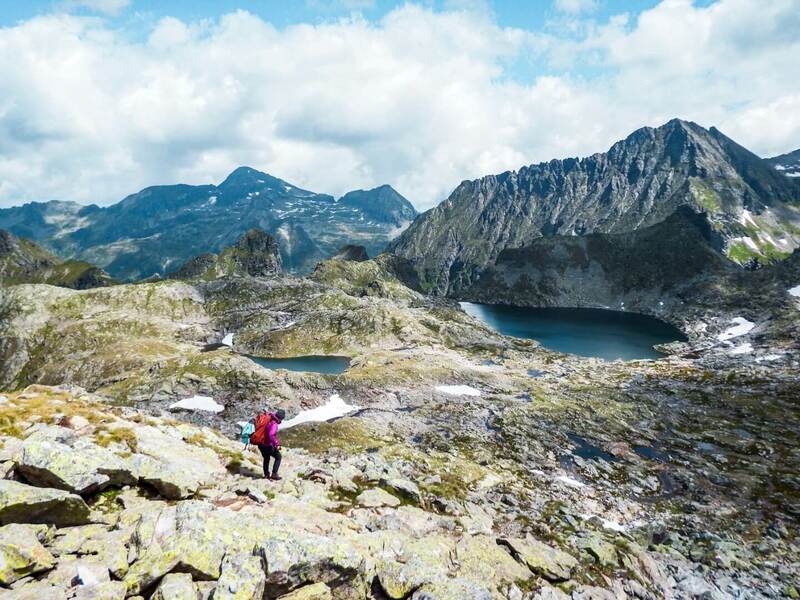 This hut-to-hut hike in Styria (Steiermark in German) is typically completed in 5, or 7 days. 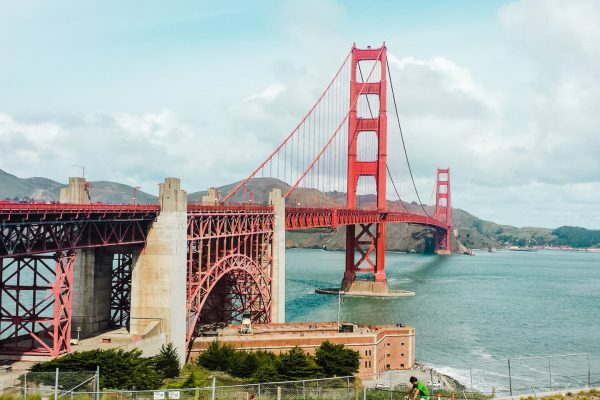 If you want to experience the region, but don’t want to commit to 5+ days, you can easily shorten the hike. During the trek, you’ll stay in charming mountain huts in either a lager (dormitory-style room) or a private room. 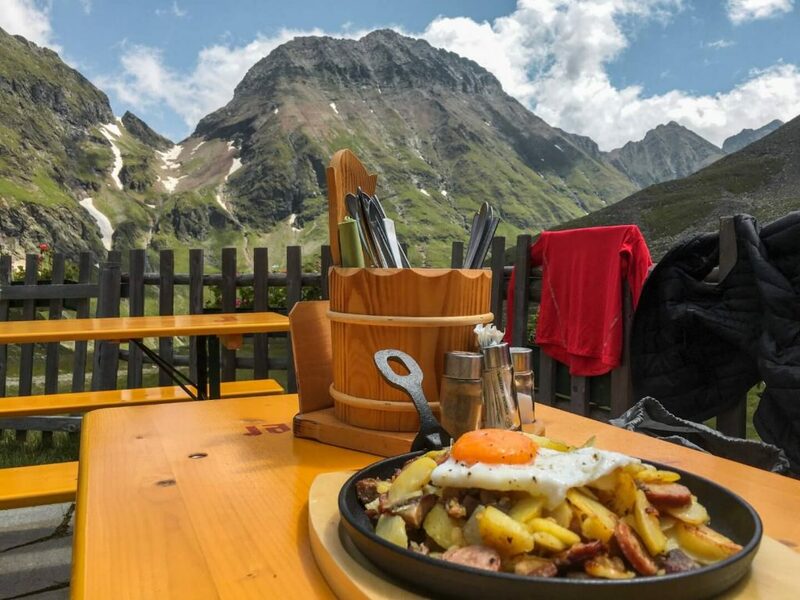 Each hut serves hearty Austrian cuisine for lunch and dinner as well as a simple buffet breakfast. 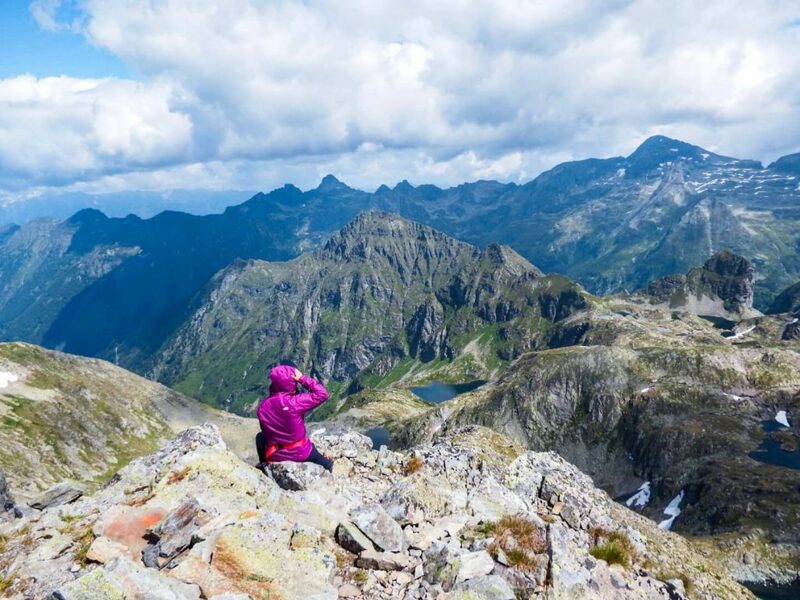 Where are the Schladminger Tauern mountains? The Schladming Tauern mountains are a subrange of the Austrian Central Alps. Along with other mountain ranges, they form part of the Lower Tauern (Niedere Tauern). Schladming Tauern are located in the Austrian federal states of Salzburg and Styria (Steiermark). The closest town, or transportation hub, is Schladming. The highest peak in the mountain range is Hochgolling, elevation 2,862 meters. 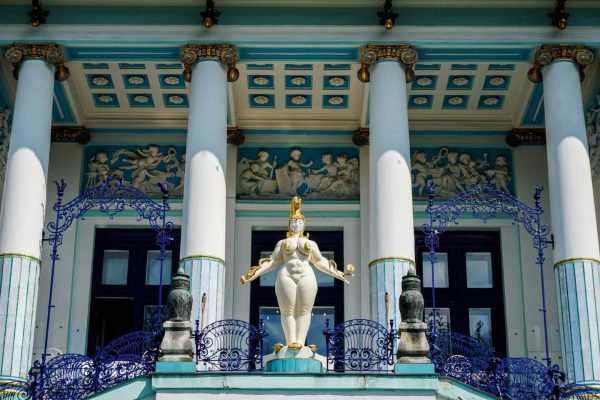 It’s important to make reservations for overnight stays at least 1-3 weeks in advance. The only reliable way to make a reservation is by calling the hut directly. Forget email. You can choose between sleeping in a lager (dormitory), or your own room. If you want to save yourself the hassle of booking everything yourself, you can reach out to the Schladming Tourist Office here. 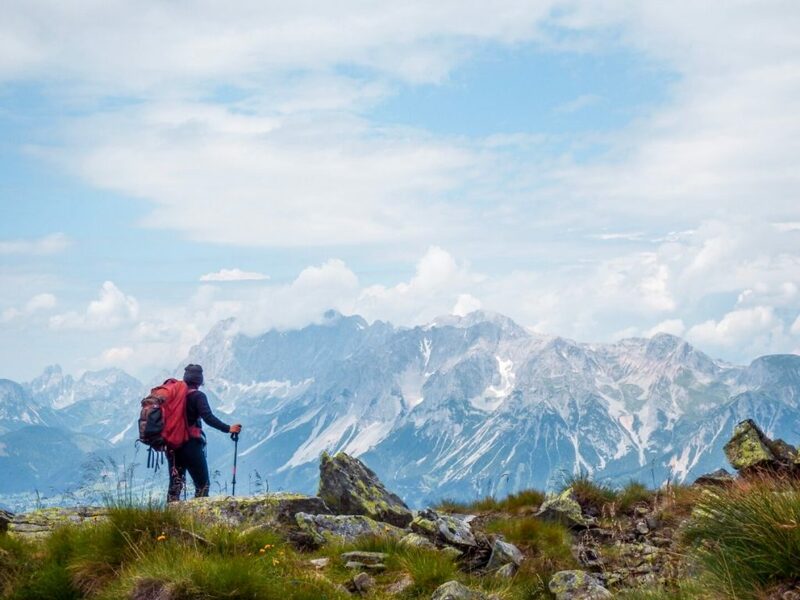 They offer a Schladming Tauern Hiking Package, which includes breakfast and lunch everyday, transit up and down the mountain, mountain hut as well as pre- and post-trek accommodations in the valley. You’ll get a significant discount on your overnight stay, if you present your alpine club membership card. There are tons of alpine clubs throughout Europe, so just confirm with the hut owner whether your alpine club is accepted. 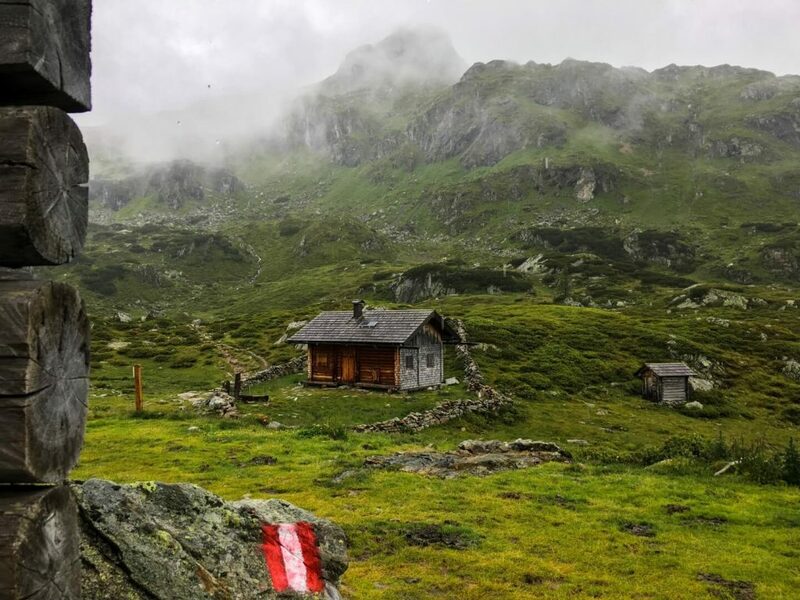 We’re members of the Österreichischen Alpenverein (Austrian Alpine Club), and so we receive discounts on all mountain huts that have contracts with the Austrian Alpine Club. Appliance Charging (phone, camera batteries): Depends on the hut. Sometimes it’s free to charge, other times they charge an hourly rate. We paid 0.50 EUR for 30 minutes of charging in Ignaz-Mattis Hütte. 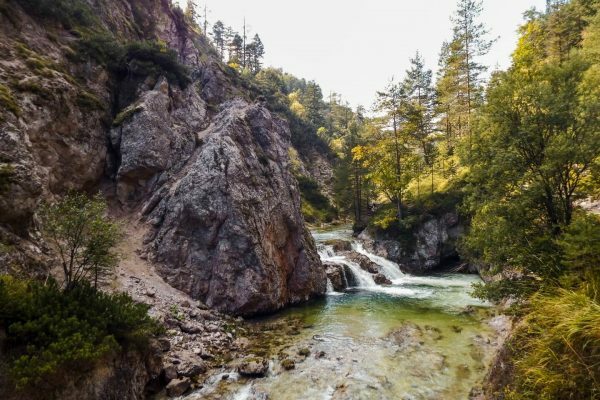 It’s a good idea to spend the night in the town of Schladming, before and after this hike. That’ll make your experience more relaxing. Look for Schladming accommodations here. The best way to get to Schladming is either by train or by rental car. If you’re flying, Salzburg Airport is the closest airport to Schladming, followed by Graz. 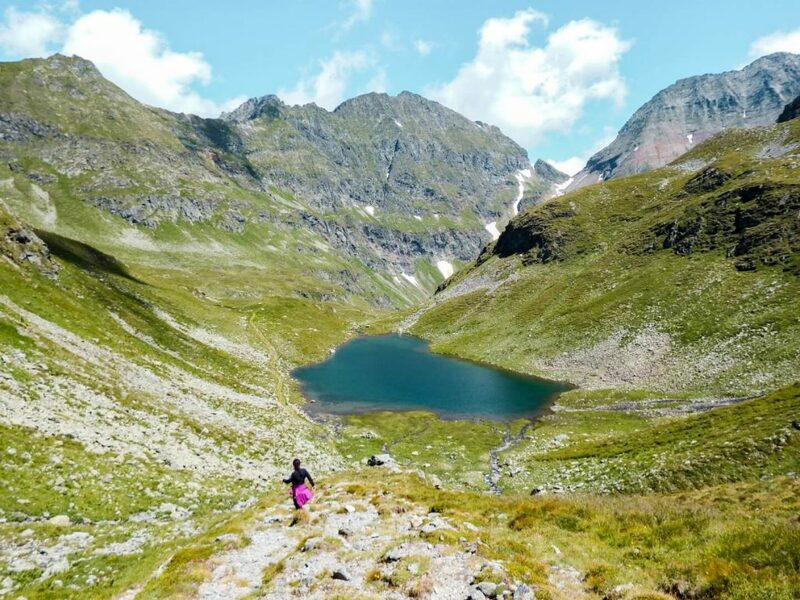 On Day 1, you can either hike to the Giglachseen lakes from Hochwurzen (longer), or Ursprungalm (shorter). This segment of the tour is called “Höhenweg Giglach” or High Trail Giglach. The traditional starting point for the Schladminger Tauern High Trail is the Hochwurzen Gondola in Rohrmoos, which is very close to Schladming. You’ll take the Hochwurzen gondola (Gipfelbahn in German) to the summit, where the trail begins. The gondola costs 10.50 EUR per adult (as of 2018) one-way (see pricing here). If you’re arriving in Schladming via train, you can hop on a bus to Hochwurzen, directly from the train station. 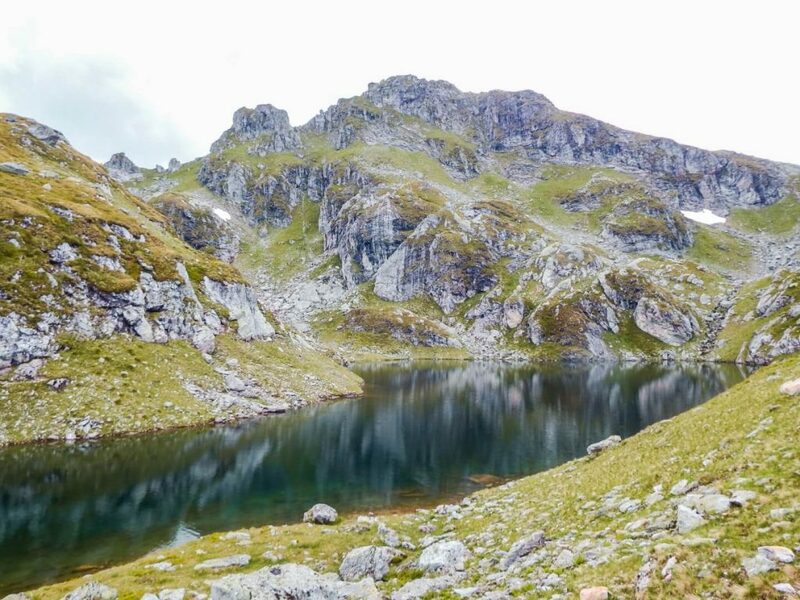 The 11.3 km hike to the beautiful Giglachseen lakes takes 6 – 6.5 hours. Total ascent: 830 meters. Total Descent: 720 meters. As you ascend, you’ll see views of the Dachstein mountain range and pass some fairytale-like lakes, including Klammsee and Brettersee. 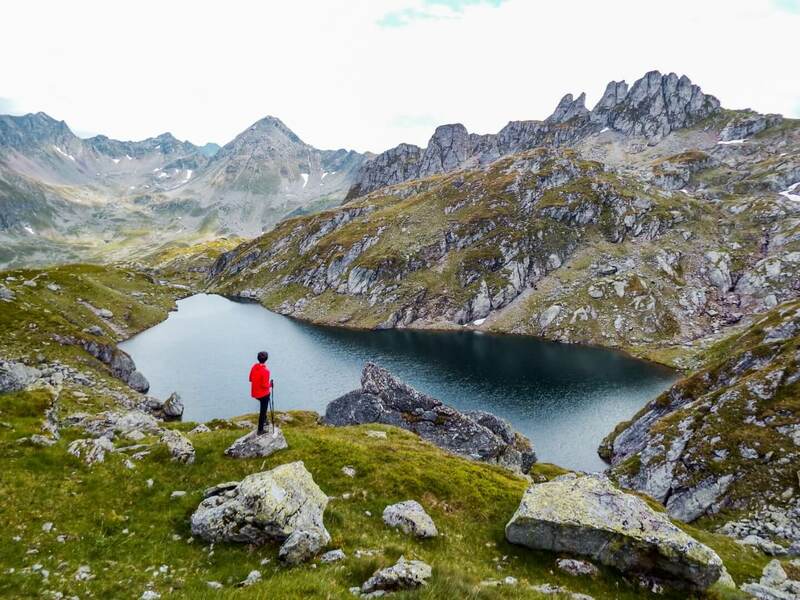 The final stretch of the hike offers epic views of the Giglachseen lakes. As you descend further, you’ll see the mountain hut Ignaz-Mattis Hütte (1,986 m). If you have less time on Day 1, or simply want to take it easy, you can start the hike in Ursprungalm, which is a high alpine meadow. To reach Ursprungalm, you’ll need to take a bus from the train station. These buses only depart three times a day, so make sure to check the schedule before. We bought a Hiking-Combo Ticket (Kombitickets für Wanderer in German) for 19 EUR from the bus driver, which covered the bus ride to Ursprungalm as well as the Planai Gondola descent on the last day. 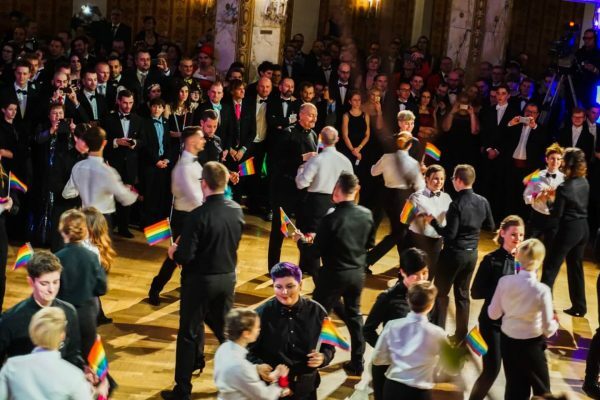 See current pricing here. 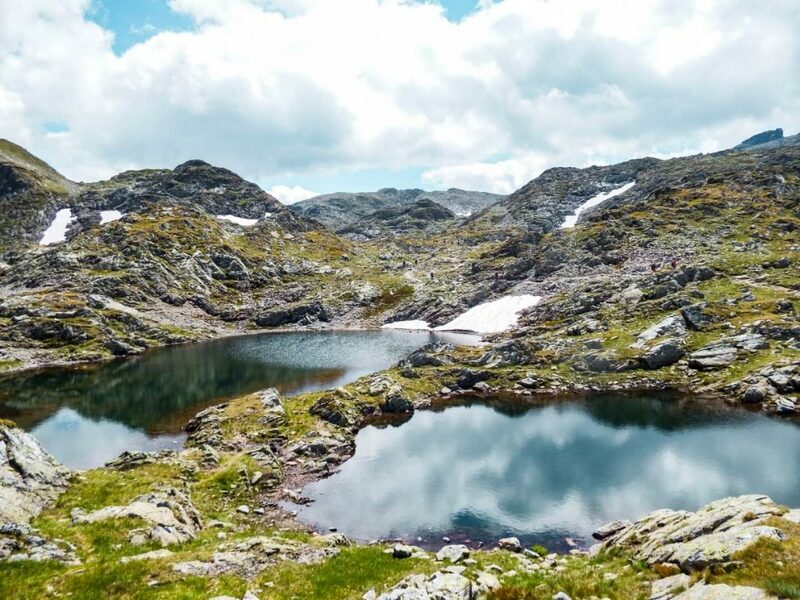 The hike from Ursprungalm to the Giglachseen lakes takes 1 hour. 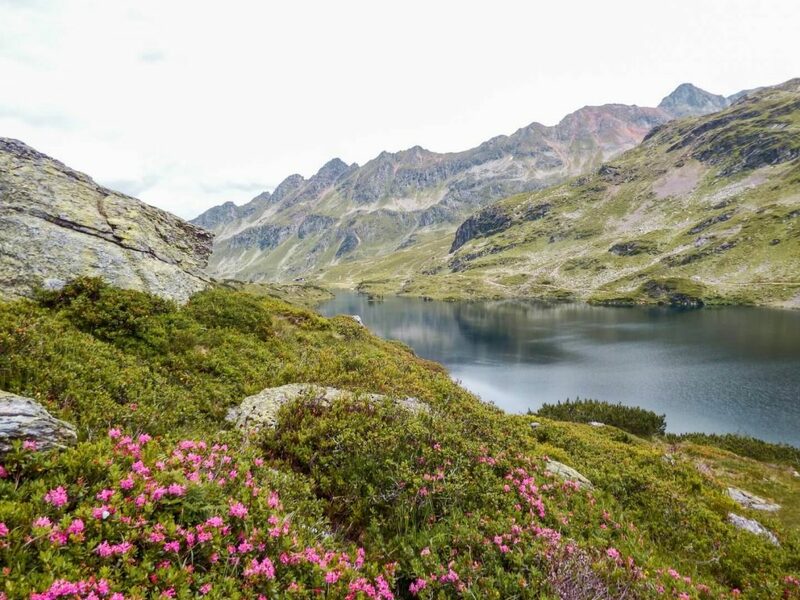 You’ll first arrive at Giglachseen Hütte and then take a path along the lake, or above the lake (20 minutes) to Ignaz-Mattis Hütte. These two lakes are a popular destination for day-hikers, so you’ll see more people on this segment of the trail than any other. 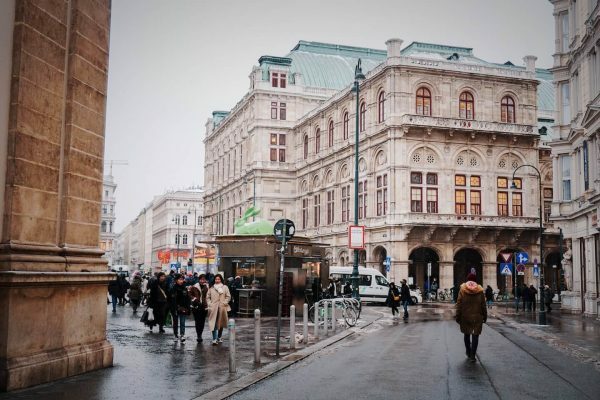 We opted for this route because we started our day at 4:30 a.m. from Vienna and the weather wasn’t promising. After lunch at Ignaz-Mattis Hütte, we hiked up to Klammsee and Brettersee to see some of the highlights of the Giglach High Trail. Giglachseenhütte is located close to Oberer Giglachsee (Upper Giglach Lake). Ignaz-Mattis Hütte is perched above Unterer Giglachsee (Lower Giglach Lake). This is where we stayed. The mountain hut has a sunny terrace with heart-expanding views of the Lower Giglach Lake. The interior is rustic, warm and cozy. We slept in the lager (dormitory), which was really comfortable. Food was excellent! On Day 2, you can either hike to Keinprechtshütte via Rotmandlspitze (peak) or via Duisitzkarsee (lake). The 5.9 km hike to Keinprechthütte takes 4-4.5 hours. Total ascent: 530 m. Total descent: 620 m.
The trail continues to the eastern end of the Lower Giglachsee Lake and past a few wooden huts. 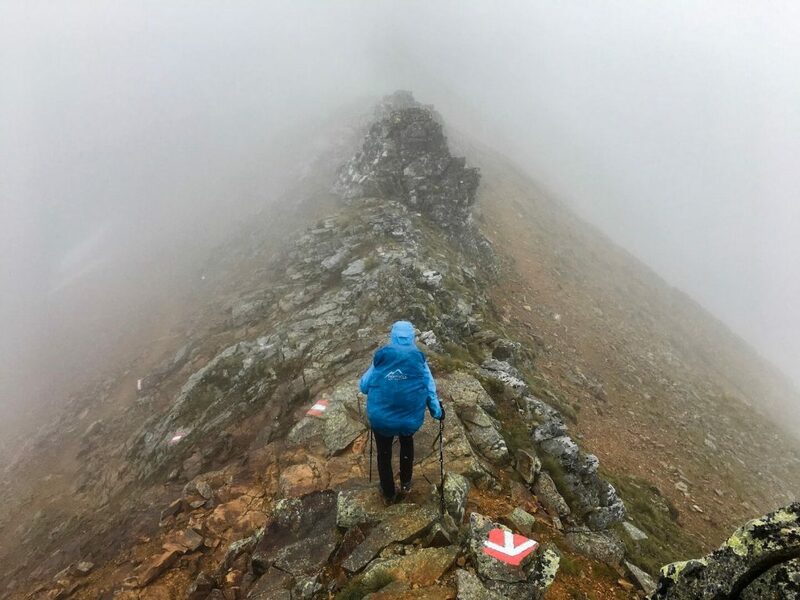 The trail then starts to slowly ascend to the peak Rotmandlspitze (2,453 m). After traversing scree and a series of switchbacks, you’ll summit the peak. The trail then quickly descend to the perfectly situated Keinprechtshütte, which is located in an alpine cirque. We hiked Day 2 in rain and fog. Given the slippery rocky terrain, it was a very difficult hike. Though our views were obscured most of the day, we were able to make out our destination during the final stretch. Rock-walls form the dramatic backdrop of Keinprechtshütte. 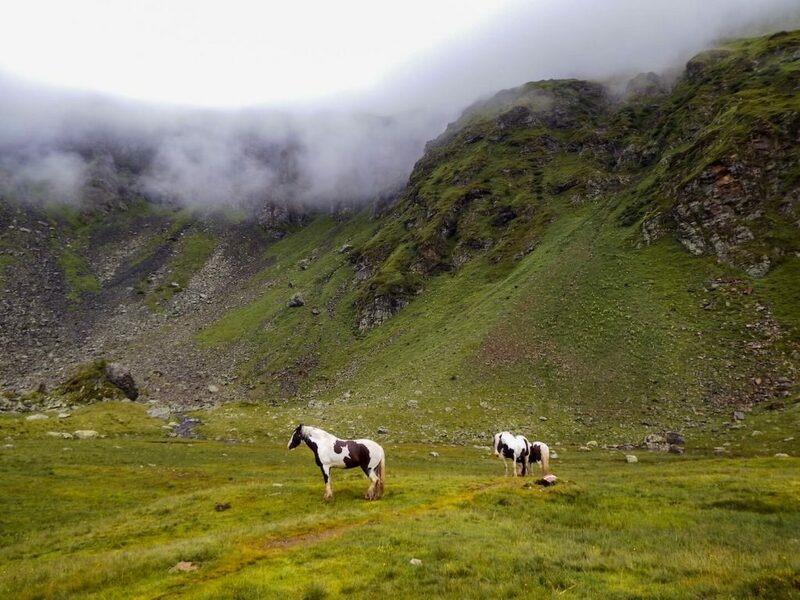 Horses dot the high meadow surrounding the hut. The wooden hut looks like something out of a storybook. 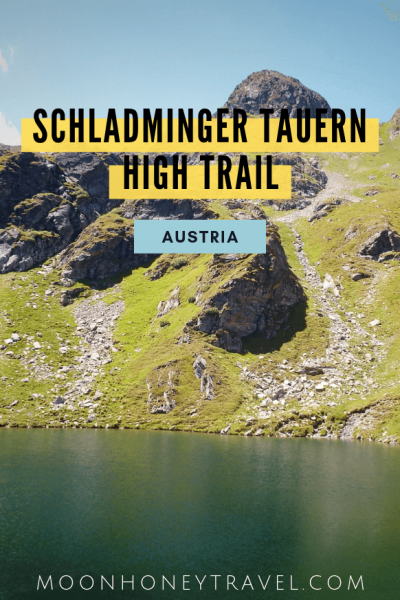 Note: this isn’t the official Schladminger Tauern high trail, but from what we heard it’s a really delightful alternative to the Rotmandlspitze route. The hike takes about 1 to 1.5 hours longer than the high trail. 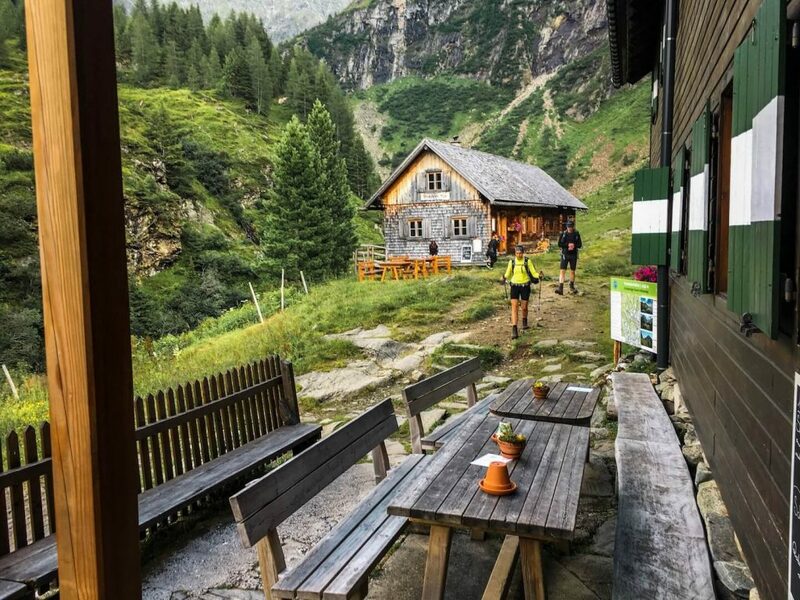 At the Duisitzkarsee lake (2.5 hours from Giglachsee lakes), there are two mountain huts, where you can break for lunch: Duisitzkarhütte and Fahrlechhütte. The only reason we opted against this route was because of the weather. With zero visibility and rain, we simply chose the shorter option. Lovely, warm and cozy. We slept in the lager, which was very comfortable. The hut also has private rooms available. There are free charging areas in the sleeping quarters. The hut owner and staff were extremely convivial. We spent the evening eating and playing games with fellow hikers in the dining area (Gastzimmer). The Gastzimmer has 6 large wooden tables and encourages visitors to relax and engage in conversation. The food was exceptional. 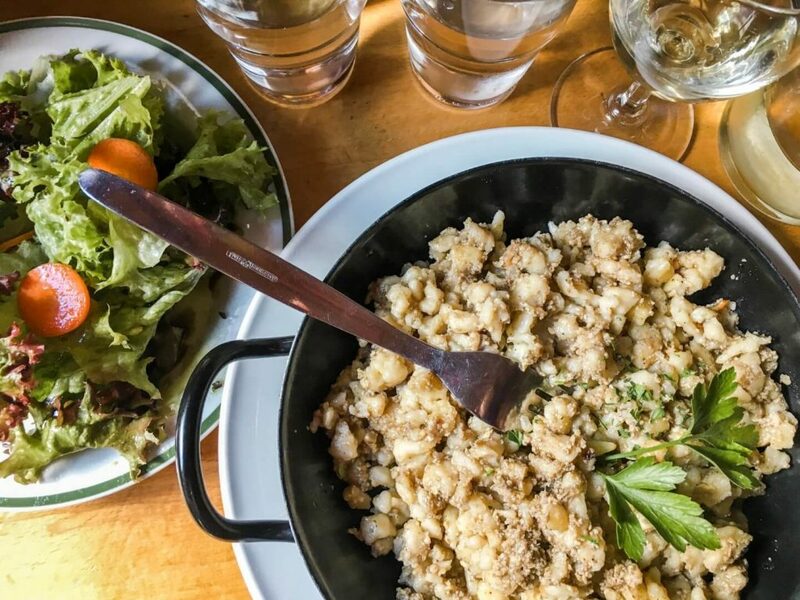 For dinner, we ate the Bergsteiger meal, goulash, and Kaiserschmarrn. Day 3 requires stamina as you’ll ascend not just one mountain, but two. Luckily there’s a mountain hut in the middle of the trek, where you can take a break and eat lunch on a sunny terrace. The hike to Gollinghütte is 9.1 km and takes 6 – 6.5 hours. Total ascent: 960 m. Total descent: 1180 m.
After departing Keinprechshütte, the trail begins ever so gently. We passed a number of grazing cows, before starting the vigorous climb to Trockenbrotscharte ridge. 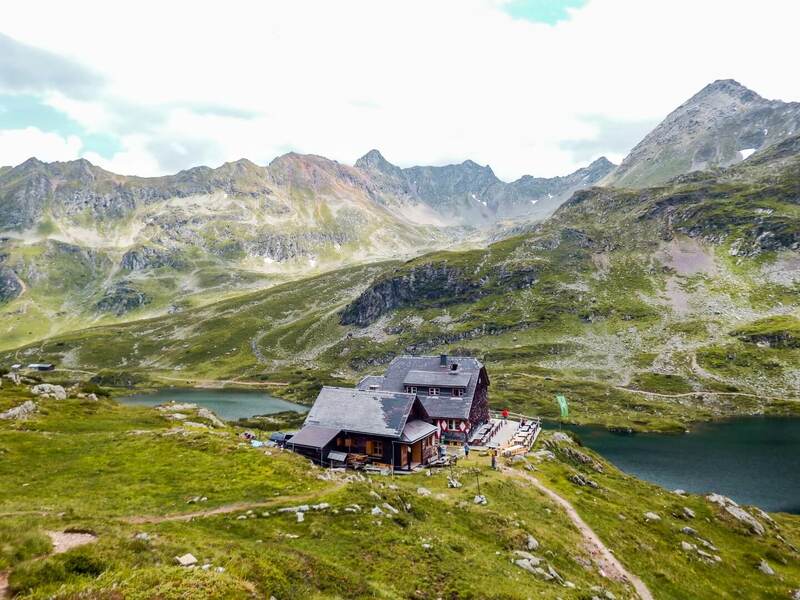 At Trockenbrotscharte, you can see the welcoming sight of Landwirseehütte as well as the two lakes situated above the hut in an alpine cirque. The descent to the hut is relatively easy. 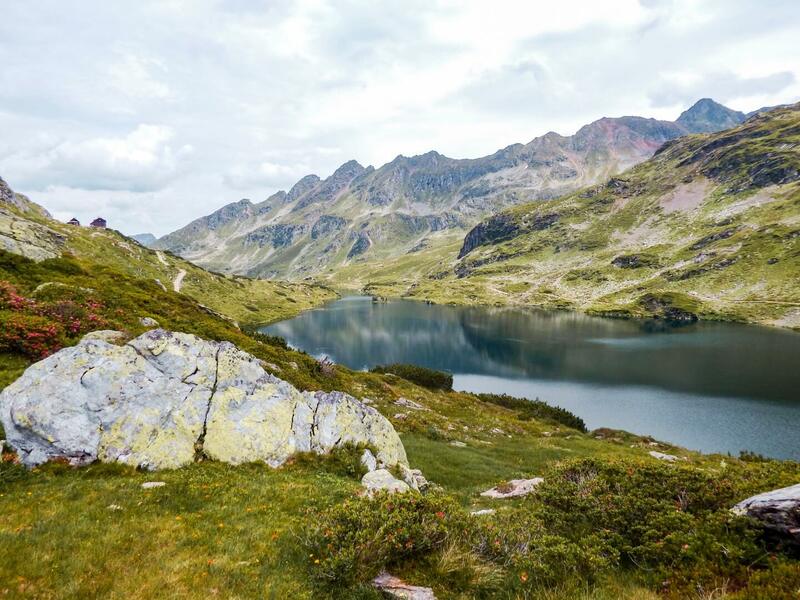 After a filling meal of Bauernpfandl (Farmer Pan – egg, potatoes, sausage) at Landwirseehütte, we decided to take a detour to see the Unterer and Oberer Landawirseen lakes (also spelled Landawierseen). Allow an extra 45 min for this detour. After following the wide dirt road from the hut for about 15-20 min, you’ll veer left and start the second steep climb of the day to Gollingscharte ridge (2326 m). 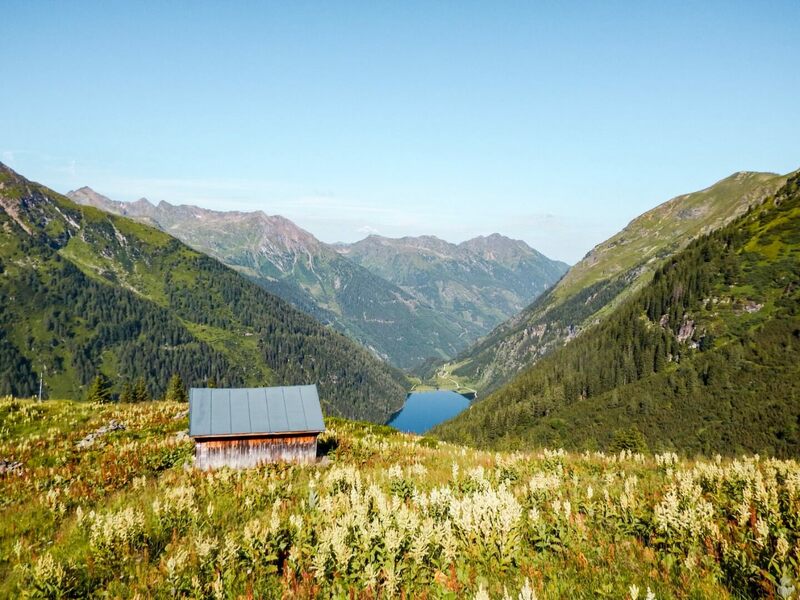 At Gollingscharte, you have the opportunity to hike all the way to the top of Hochgolling. At Gollingscharte, we took a 20 minute break, before starting the long descent through scree to Gollingwinkel. When the trail finally plateaus, you’ll arrive in Gollingwinkel, a glorious natural amphitheater at the foot of Hochgolling’s north face. Next, the trail continues through a meadow and along a river to the mountain hut Gollinghütte. The flat grassy footpath feels like heaven beneath your feet. Today’s hike is long and requires focus and endurance, as you’re hiking over two mountains and descending 1180 meters. 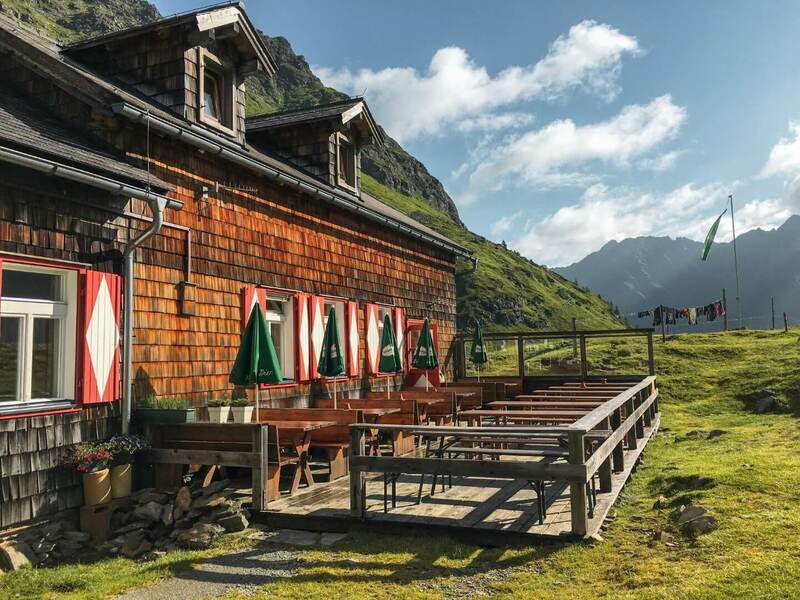 You can break up Stage 3, by spending the night in Landawirseehütte. This is a great option for families with young children. 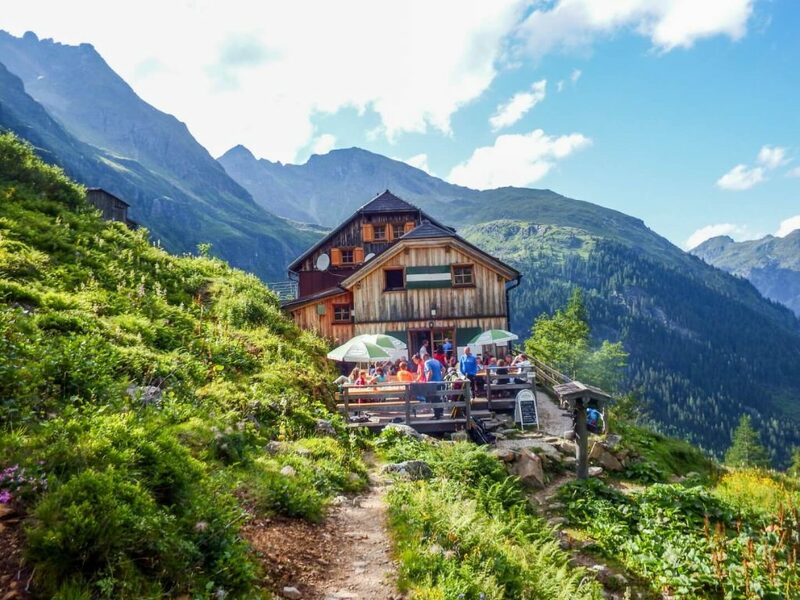 Located on a river, the charming Gollinghütte is a busy mountain hut that is situated at the crossroads between the Schladminger Tauern High Trail and the valley trail that leads to Schladming in 4.5 hours. 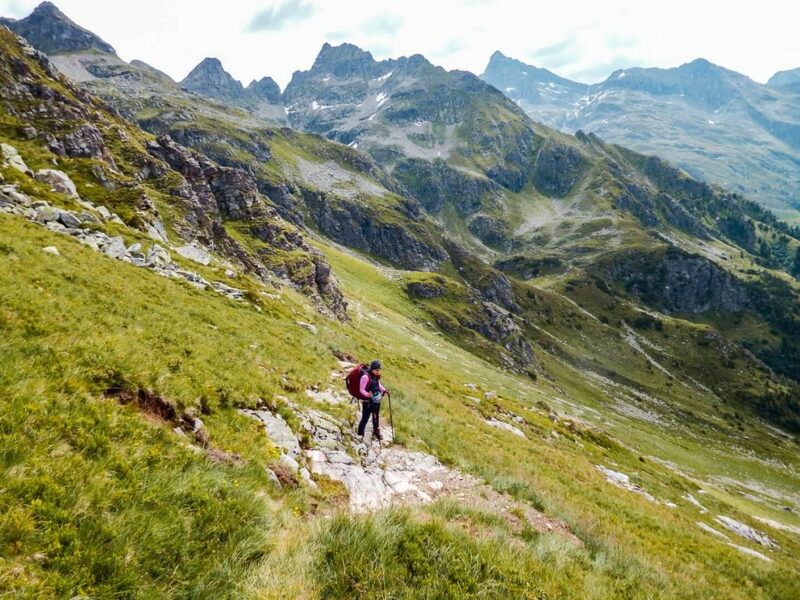 Each day of the Schladminger Tauern High Trail is glorious, but Day 4 might be the most impressive. 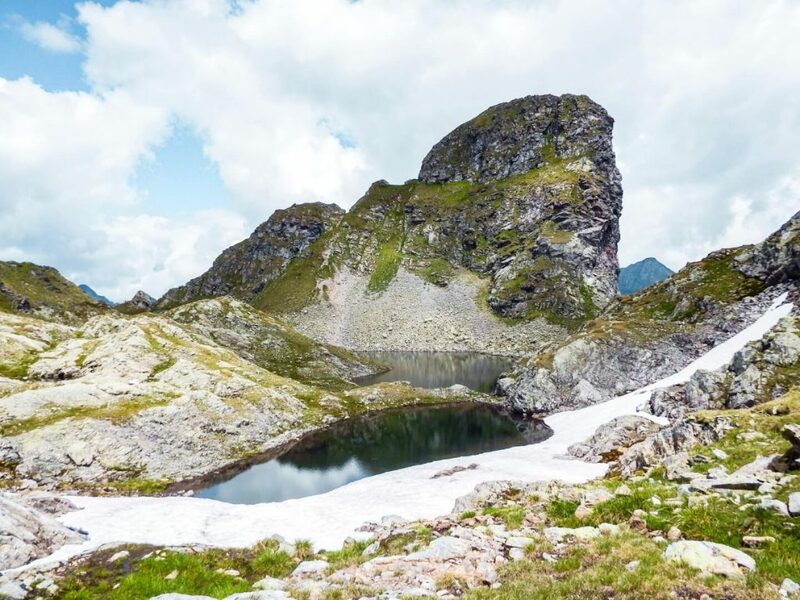 After climbing to the summit of Greifenberg, you’ll descend into Klafferkessel, a high alpine plateu dotted with 30 mountain lakes. Today’s 7.7 km hike takes 6-6.5 hours. Total ascent: 1030 m. Total descent: 1030 m.
The trail gets down to business in no time. 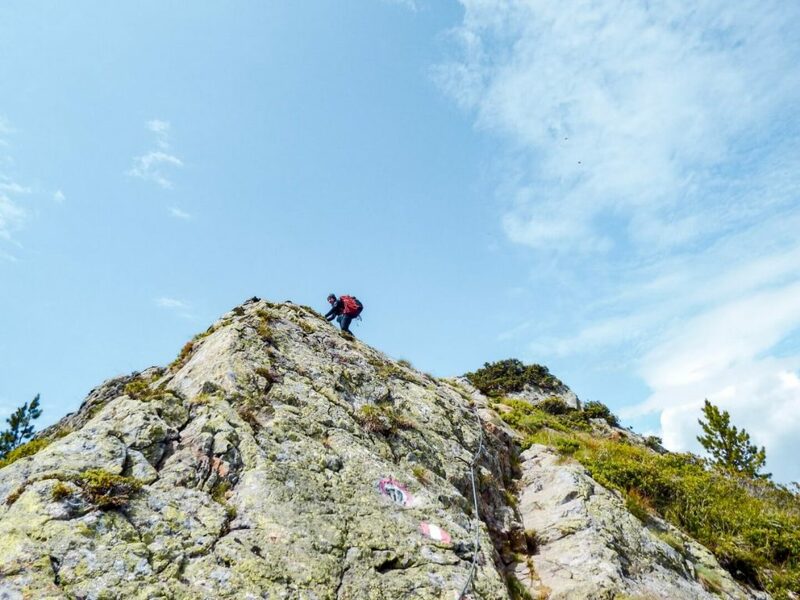 Before you know it, you’re climbing uphill for three hours. 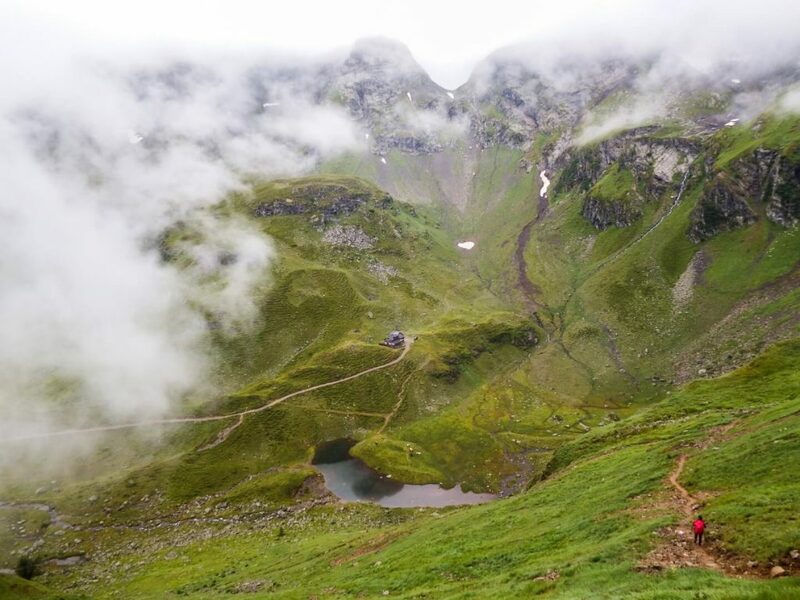 The unrelenting trail plateaus at Greifenbergsattel, where there’s a small lake at the mountain saddle. We took a break here before tackling the final stretch to the top of Greifenberg. Greifenberg is marked by a large cross. From the summit, you’ll have terrific views of the water-inundated landscape of Klafferkessel. 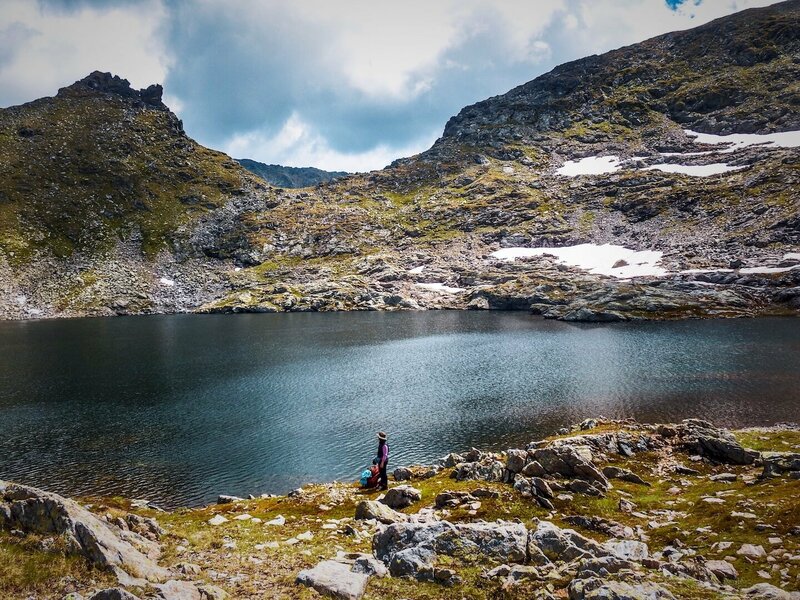 The rocky descent is a bit tedious, but you’ll soon arrive in an alpine wonderland full of lakes of varying sizes. This unique landscape is a relic of the Ice Age. The trail continues along numerous pools of water, offering a visual paradise and a respite for tired legs. 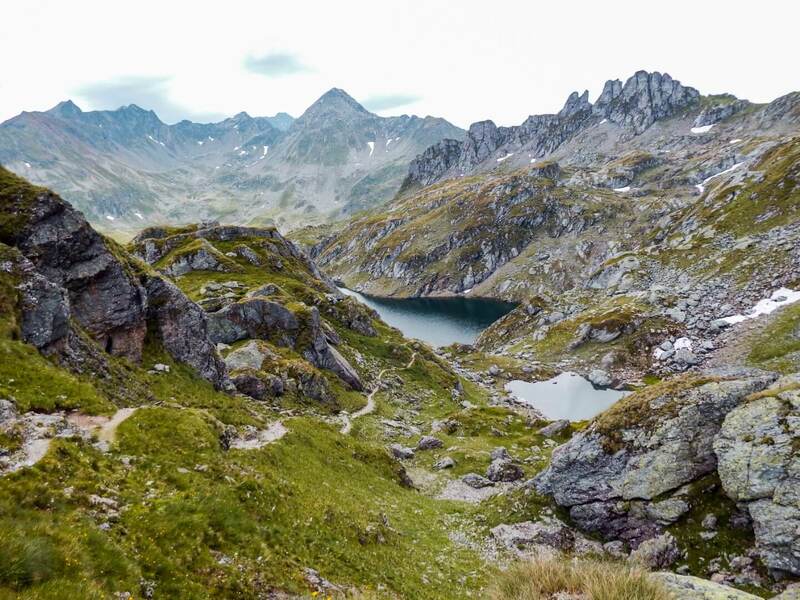 Eventually the trail nears the edge of the tarn landscape and plummets in the direction of Preintalerhütte. Preintalerhütte is located next to the dairy farm Waldhornalm. For those who want to try fresh buttermilk, Waldhornalm is the place to indulge. Located next to river and overlooking a valley, Preintalerhütte is a large mountain hut, which marks the last night of the 5 stage journey. We arrived in Preintalerhütte and immediately treated ourselves to Kuchen (cake) and Kaffee (coffee). Their Nuss-Schoko Kuchen and Apfelstrudel were both excellent. We spent the afternoon relaxing in the sun across Waldhornalm. The rustic wooden hut serves fresh dairy products as well as snacks. Dinner here was excellent. 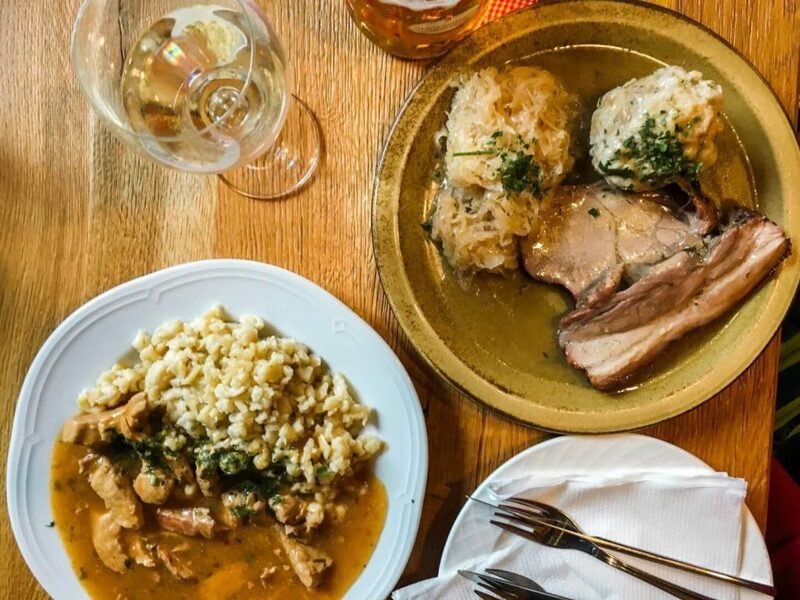 We tried the Käsespätzle with regional Styrian cheese as well as Schweinsbraten. Yum! Stage 5 of Schladminger Tauern is also called the Planai Höhenweg. It’s indeed a high trail. If you’re scared of heights, head back to Schladming through the valley. Many areas of the trail are assisted with steps and ropes, but some areas could use some more assistance. You’ll climb up to the ridge of the mountain and follow closely along or just under the ridge for hours. It’s dramatic, it’s challenging, and it’s long. The 11.3 km Planai High Trail takes 7 to 7.5 hours. Total Ascent: 1125 m. Total Descent: 955 m.
It’s important to start the hike early. We suggest starting no later than 7:30 a.m. The last gondola down to Schladming is at 5 p.m., and you absolutely don’t want to rush the last 2 hours of the trail. 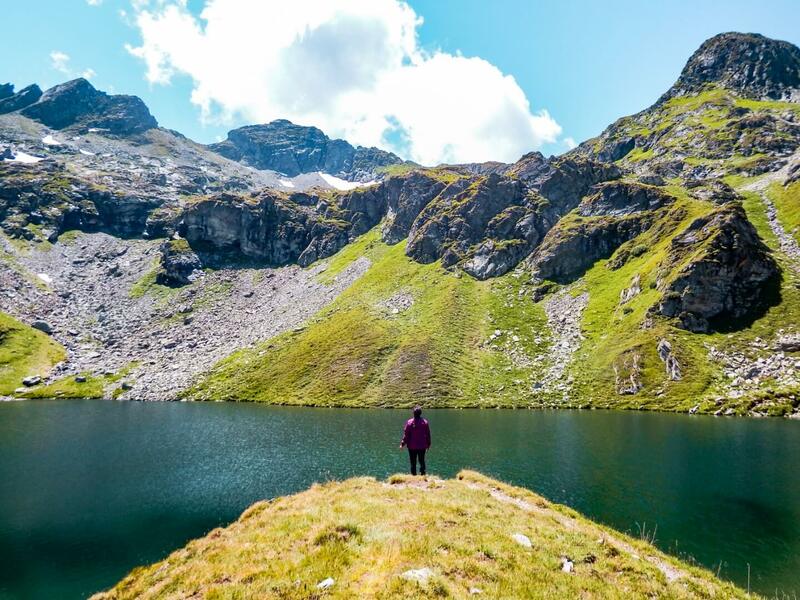 After 1.5 hours, you’ll reach Neualm, a high alpine meadow with a deserted mountain hut and view of Riesachsee lake. The hike continues uphill for a few hours and plateaus at Spielbühel (nice place for a break). Unlike the previous days, there’s more variance in the ascent, so you’re not going uphill continuously. After Spielbühel, you’ll descend and then follow the footpath just below the ridge line. The views of the valley and mountains remain mostly constant. 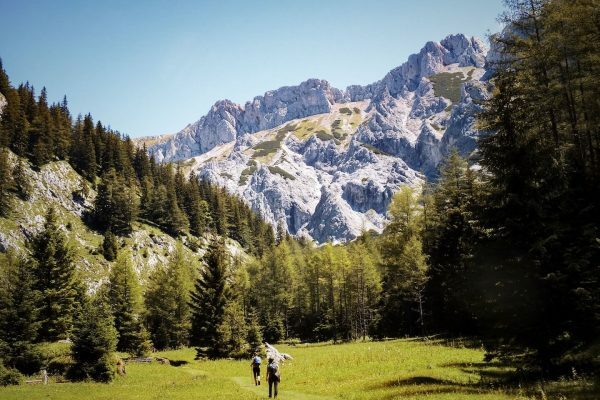 As the trail progresses, you’ll see the imposing peaks of the Dachstein massif. The last segment of the trail is on a wide, even path. Eventually, you’ll reach an intersection, where you can go right or left via the Panorama-Weg to the Planai Mountain station. When you finally reach the Planai, you can celebrate your success with lunch and a Schnaps. Remember that the Gondola station that connects Planai with Schladming closes at 5 p.m.
Sleeping Bag Liner. Each hut provides sheets, blankets and pillows, but you need to bring a sleeping bag liner. 1-Liter Reusable Water Bottle. We both carry at least 1 water bottle each. You can refill your reusable water bottles at the mountain huts. Hiking Pants. When buying hiking pants, we think flexibility and ability to shed water are two important criteria. We both bought two pairs of these Macpac Women’s Hike Tight Pants and we love them. They’re breathable and extremely comfortable in all types of weather. Bonus: you don’t need to wear a belt. Hiking Boots. If you want to invest in a serious hiking boot that will serve you well in rocky, high alpine terrain, look into buying a pair of Hanwag Tatra Light Lady GTX. These shoes have an extraordinary profile and aren’t rigid like traditional alpine boots. Merino Wool Hiking Socks. Icebreaker makes the best hiking socks out there. Socks have lifetime warranty. Hiking Poles. Opt for poles with lever locks (flick lock mechanism), as opposed to twisting locks. They’re more durable. Hiking Backpack + Raincover. Ideal hut to hut trekking backpacks: Osprey Packs Kyte 36 Women’s Backpack or Osprey Packs Kestrel 38 Backpack for Men. Rain Jacket. There’s always a chance of rain in the Alps. It’s essential to always carry a proper rain jacket. Kati’s North Face Venture Rain Jacket is excellent quality and truly waterproof. Down Vest or Hiking Vest. Everyone has different preferences, but when it comes to keeping your core warm on the trail, but not overheating, vests are your best friend. Sabrina never hikes without her Eddie Bauer StormDown Vest. Fleece (one for hiking, one for sleeping). It’s always good to have a fleece with you for added warmth. Fleece sweaters are lightweight and dry quickly. Buy a Marmot Norhiem Women’s Sweater Knit Fleece Jacket on Amazon. Waterproof House Slippers (something you can also shower in). After a day of hiking, it’s so enjoyable to finally take of your boots and slip on a pair of Crocs. Basic Cosmetics. Soap, Shampoo, Toothbrush, Toothpaste, Sun-lotion, Deodorant, Chapstick, Nail Clippers. Travel Towel. Opt for a thin, microfiber towel that dries quickly. Ear Plugs. We always carry several pairs of ear plugs with us when we’re overnighting in mountain huts. There may be affiliate links in this guide. If you make a booking or a purchase using the links, we’ll get a small commission at no extra cost to you. It’s how we cover the costs of running the blog!